Register on or before Friday, March 22. This is an instructor-led workshop; you do not need to bring a laptop. More than half of administrative professionals surveyed list Microsoft Outlook as their most-used application. Everything that makes us better/faster/stronger with Outlook improves our whole work day — so let’s get to it. After a quick review of Gini’s favorite tips, we will focus on powerful but lesser-known Outlook features that will make you more efficient with Outlook. Microsoft Word is software we use so often we believe we know it completely. It’s basically just a glorified typewriter, right? What more is there to know? In this session, we’ll focus on power user features of Microsoft Word — features that are useful no matter what type or length of document you are creating. If you have a question about a document you are working on, save it on a USB drive and bring it to the Q&A session. Have questions about a Microsoft Office app? Do you have a problem that is stumping you and perhaps your IT folks, too? Bring your questions to Office Q&A. Gini von Courter and a handful of your closest MHCEA colleagues will provide answers, or at least remind you that you are not struggling alone! If you have an issue with a specific document or type of document, please bring a sample document on a USB drive. Be sure to mask or remove any sensitive document data. Take this opportunity to renew friendships and welcome new members or those attending for their first time. It is sure to set the pace for a conference that is both informative and educational. Relax while dining and networking with your peers. Casual dress. The hotel restaurant will have a breakfast buffet available. 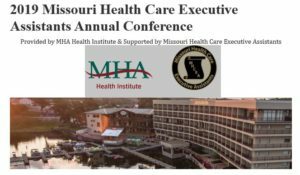 Daniel Landon will present an overview of the Missouri Hospital Association, as well as issues facing health care in today’s fast-paced world. On The Right TrackTM Training & Consulting Inc.
Let’s face it — times change. Fashion changes, music changes and language changes. If this weren’t true, we all could be speaking the same way Shakespeare did (which makes me glad that language changes). If language changes, so must our writing styles. Just because it was “right” when you were a kid, doesn’t mean that same writing or grammar rule is still right. Grammar and business writing is evolving as well, and if we are professionals, we must evolve with it. This session is going to bring your writing skills up to date. Participants will learn the following. The danger of not keeping your skills up to date is your reputation. You can fix that! I get it, you’re good at what you do — but are you remarkable? Do you really stand out as “one of the best?” And if you’ve been doing your job for a while now (let’s say, more than five years), how do you know if you are that good anymore? Are you relying on your own self-taught skills to make you remarkable? Think about how much has changed in the last five years alone. The reality is that we learn on the job. We learn as the tasks get sent our way. There isn’t a “manual” on what this job means anymore. The administrative role isn’t what it used to be. It probably isn’t what it was when you started — and it certainly won’t look like this in 10 years either. Are you keeping up? Are you aware of the changing dynamics to be an administrative professional in this day and age? Often, we don’t get a lot of opportunity to attend training, to keep our skills cutting edge or to even know how we compare in the marketplace. If you’ve been unfortunate enough to have to look for a job in our current economy, you probably realize that your skills sometimes are not enough. What is going to make you valuable to your current company, and what will make you stand out among a stack of resumes and interviews? MHCEA will award scholarships for this conference. Please view the scholarship criteria and complete the application. This year’s MHCEA charitable organization is State Fair Community College’s 14th Annual Hire Attire. Help prepare students join the workforce by donating gently used men’s and women’s professional career clothing. Dress and dress casual clothing, such as jackets, slacks, shirts, ties, blouses, skirts, suits, dresses, sweaters and accessories (scarves, purses, belts, etc. ), can be donated. Donated items first will be sold to students, then SFCC employees for $2 each, then what’s left will be available for sale to the public for $1 per item. Proceeds from the Hire Attire sale fund student scholarships and Hire Attire awards. Cash donations also are accepted and will go to the Hire Attire Endowed Scholarships fund. If you are not a member of MHCEA and would like to join for $30, please submit payment with your registration fee or join online. 2020 Annual Conference at Camden on the Lake. Copyright MHCEA. All Rights Reserved.